An interesting discussion has been happening on facebook, started by abstract painter Madeline Denaro, with a picture of her studio table loaded with paints, mediums, brushes — you name it — showing a very creative and free-flowing process. I jumped in and said that both my studio and my kitchen would seem messy to the untrained eye, but actually I do know where everything is. In fact, when I go a little overboard cleaning up, then I can’t find anything for a while, until I get it sufficiently messed up again. 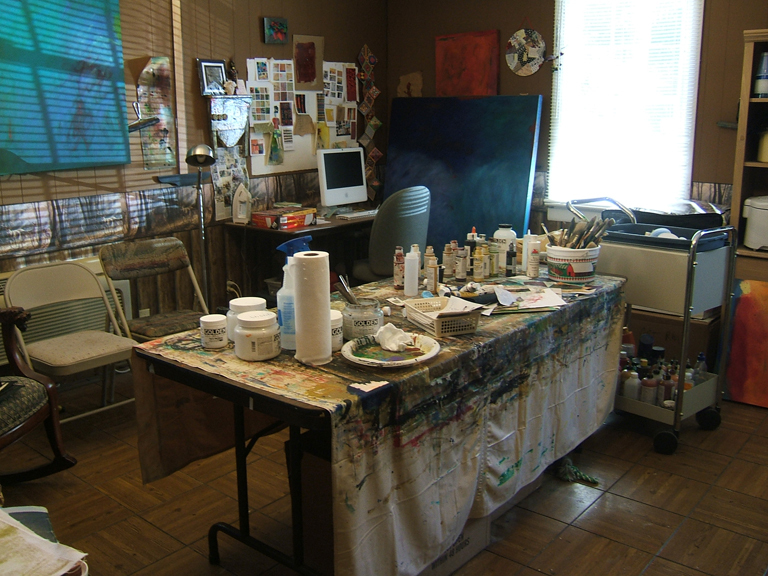 So that prompted me to show a picture of my studio “mess” and just put it out there for you to comment, share, or show your own creative surroundings. If you have a blog or are on flickr or facebook, feel free to put a link in this comments section so we can peek into your own creative retreat! OK, here goes. I’ll show you mine if you’ll show me yours. Having had the honor of painting in your kitchen, I picture exactly what you mean. The freedom you need in the creative process demands organization of materials and thoughts. Most of us plod through the process not understanding where spontaneity can take us when we don’t have to think about other thins, like where the big spatulas or the new big brushes are hiding. We can all learn from you. Annette, I’ve noticed that I have much more freedom to cut loose when I know where my “stuff” is! So lovely, Rita! I love your space. You are fortunate to have something so open and light-filled. Thank you for sharing your pics! My studio is at least 4 times the size of yours, with 4 or 5 times the “stuff” since i think I need every art material known to man and also recycle a lot of stuff. I’ll try to get a photo of it. LOL! Sue, I don’t know what I would accomplish by having a bigger studio. Just more stuff, I’m certain!! While I’m working on a project (or 2) I also have an “organized mess”. When I put my hand out for an item I’d like it to be there too, for time and sanity sake. After the project is over I do put things in their “place”, so that when the next project comes along I can reach for those things to recreate another “organized mess”, and on and on. Doesn’t everybody work this way, ha! Shirley, I work pretty much the same way. My mess stays out while I’m working on a series of works in the same medium, I suppose you could say. If it’s acrylics, I can go on for weeks (months?) and just leave it all out. But then when I want to switch to collage for a while, that’s when I clean it all up and start over. I do love looking at the super-organized ones too, Bren! But if mine were pristine, I’d be pretty inhibited in my creativity. Sherrill, it’s actually a finished piece that’s parked beside the computer table. It’s very large, as you can see — 4×5 feet. Sorry Martha, I didn’t know it was finished…it’s very hard to see. But what I could make over there in the shadows I really liked. Can we see it out in the open in the light sometime? I love your big pieces. Always have. Your wish is my command, Sherrill! Yes, I knew that was a bad pic, but I will put it up in my next post. Thank you!